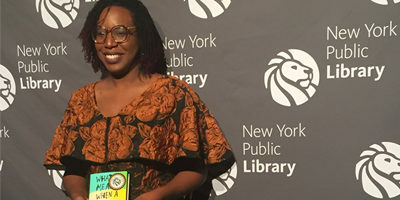 Riverhead Books is thrilled to announce that Lesley Nneka Arimah has won the 2018 New York Public Library’s Young Lions Fiction Award for her debut short story collection, WHAT IT MEANS WHEN A MAN FALLS FROM THE SKY. She received her prize during an awards ceremony at the New York Public Library on Thursday night, June 7. This is the latest in a dizzying list of accolades for Lesley, including being named winner of a 2017 Kirkus Prize, a 2017 National Book Foundation “5 Under 5” honoree, a 2017 National Book Critics Circle finalist, and a 2018 finalist in the Society of Midland Authors. Congratulations to Lesley and everyone at Riverhead. Founded in 2001, the Young Lions Fiction Award is given annually to an American writer age 35 or younger for either a novel or collection of short stories. Each year, five young fiction writers are selected as finalists by a reading committee of writers, editors and librarians.